Daily Dow Jones ended -3 points after falling as much as 82 points following below par earnings results from 3M, Johnson & Johnson and American Express as well as weak economic reports from US November home prices and unexpected decline in UK’s 4Q2010 GDP. However, strong January consumer confidence index and expectations that Obama's address to Congress will announce plans to stimulate the economy boosted investor’s sentiment for a late market recovery. 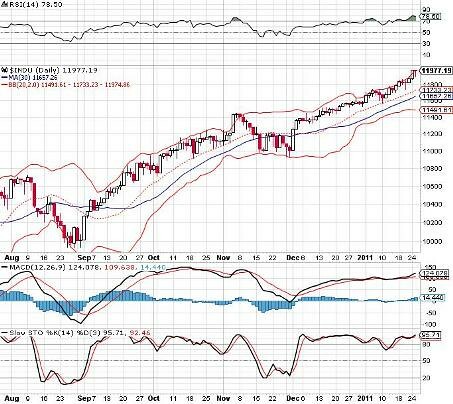 Daily Dow Jones positioned at toppist and possible to due for a pullback.